Communications Support for the "Greatest Free Show on Earth"
Special Deputy John Krawczak, KJ0P, of Minnetonka, Minnesota, was recently presented the 2015 Hennepin County Sheriff's Distinguished Service Award and the 2015 Minnesota Sheriff's Association Volunteer Of The Year Award. Krawczak is a member of the Hennepin County Sheriff's Office Volunteer Services Division on the Communications Response Team. Twenty radio amateurs are members of the team that provides public safety and amateur communications support in emergencies/disasters and community events. The Puerto Rico Emergency Management Agency (PREMA) and other agencies will participate in a communications drill simulating a tsunami incident, along with radio amateurs in supporting roles. The exercise is slated for tomorrow, March 17 at 10 AM local time.The Puerto Rico ARES organization will be active, and registered on www.tsunamizone.org where more information can be found. The aim of the exercise is to test the reliability of communication systems and protocols between centers of tsunami alerts and to help emergency management agencies to improve their preparedness in the event of an alert. Since 2010, Amateur Radio operators have played a role in the exercise, executed in conjunction with the Puerto Rico Seismic Network (RSPR), the Caribbean Warning Tsunami Exercise (Caribe Wave), FEMA, the Puerto Rico Emergency Management Administration, and NOAA. 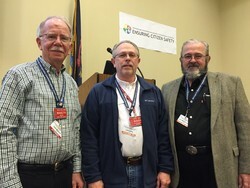 ARRL officials attend Michigan conference, l to r, Dale Williams, WA8EFK, Great Lakes Division Director; Larry Camp, WB8R, Michigan Section Manager; John McDonough, WB8RCR, Michigan Section Emergency Coordinator. featured the state's auxcomm protocols, with amateurs playing a significant role in many presentations and discussions. From the conference summary, "In an emergency, every link in the chain is critical and those links must be firmly connected. That means every agency, every leader and every employee needs to be on the same page and committed to our shared strategic vision of interoperability." NHC Session #1 - 1:30 to 3:00 PM: Dr. Rick Knabb, Director, National Hurricane Center will discuss the importance of Amateur Radio surface reporting. Bob Robichaud, VE1MBR, of the Canadian Hurricane Centre, will present on hurricane meteorological topics and an overview of Canadian Hurricane Centre operations. Julio Ripoll,WD4R, Assistant Amateur Radio Station Coordinator will present on National Hurricane Center station WX4NHC operations. NHC Session #2: 3:15 to 5:00 PM: Bobby Graves, KB5HAV, Hurricane Watch Net Manager, will present an overview of the net, use of personal weather stations and backup power/antenna. Rob Macedo, KD1CY, Director of Operations, VoIP Hurricane Net and ARRL ARES Eastern Massachusetts Assistant SEC, will discuss net operations, and best practices in SKYWARN tropical systems reporting. Ken Bailey, K1FUG, ARRL Assistant Manager of Preparedness and Response, will present the ARRL Beginner's Course in Ham Radio Hurricane Preparedness. Finally, a Q&A session and door raffle prizes will be offered. Mardi Gras is an annual celebration in New Orleans that's tied to the Christian tradition of Lent before Easter. Sixty-four parades with up to 50 floats each are enjoyed by locals and nearly 1.2 million visitors over the course of 2 weeks leading up to Mardi Gras day (literally, "Fat Tuesday," the day before Lent starts on Ash Wednesday). The multiple daily events of the Mardi Gras celebration have been called "the world's largest planned natural disaster." Eric Pickering, KE5BMU, is the City's Deputy Operations Chief in the New Orleans Office of Homeland Security & Emergency Preparedness (NOHSEP), and his team is responsible for responding to unplanned events that are real, likely, or feared. Of course, a communications infrastructure failure is high on the list of likely disasters that can be mitigated with planning and practice. And so Pickering began working closely with two local hams, Rafael Shabetai, W5BAI, and Cedric Walker, K5CFW. Together they re-activated a station in City Hall that had been built for NOHSEP by Bob McBride, AE5RN (SK) and began planning for an expansion into the NOHSEP mobile command post bus. The three had two goals: involving local hams who could serve as the "eyes and ears" of NOHSEP in a disaster or emergency, and ensuring that a robust backup communications network was trained and prepared to take over if the state-wide primary trunked 800 MHz network stopped working. remaining communications channels were via ham-operated VHF and UHF repeaters. And so Pickering, Shabetai and Walker decided to create a repeater-based training exercise, centered around Mardi Gras when so many residents/hams are out and about and likely to be carrying their H-T radios anyway. Of the 64 parades in the New Orleans area, 29 follow a similar 3.7 mile route down St. Charles Avenue and along Canal Street in the Central Business District. Three first aid stations along the route are in operation during the parades, and arrangements were made to credential ham volunteers to give them access as bases of operations. Three repeater owners (Southeast Louisiana Emergency Communications Service W5MCC, Jefferson Amateur Radio Club W5GAD, and the Greater New Orleans Amateur Radio Club W5UK) granted access to their machines for the duration of the Mardi Gras exercises. A mobile command post along the route serves the many city departments that keep the parade route safe and clear. An operating position in the mobile command post bus was set aside for net control, and a street sign next to the bus' parking place served as a convenient temporary mast for a dual-band vertical antenna. A transceiver from the City Hall station was temporarily relocated to the mobile command post, but next year a dedicated transceiver and antenna will be installed. With operation locations and equipment in place, the team's next task was recruiting a cadre of volunteers. Pickering made a successful recruitment presentation at the W5GAD club meeting. The Assistant Section Emergency Coordinator Matt Anderson, KD5KNZ, plus ARES Emergency Coordinators for New Orleans Joel Colman, NO5FD, and neighboring Jefferson Parish Nick Frederick, W4NDF, all stepped up to recruit operators for both field and net control positions, and all three volunteered as operators. It was decided to limit operations to the weekend immediately before Mardi Gras day, and to Mardi Gras day, as these dates have the biggest parades with the highest attendance. Ten volunteers participated, and check-ins from other hams along the parade route added to the numbers compiled by each net control shift. No emergencies were handled, and we were fortunate that the city's regular emergency communication infrastructure did not need a backup. The ham community demonstrated that it could serve NOHSEP professionally and reliably. This was the first year of an organized effort to bring hams into the NOHSEP operation, and it was incomplete because many parades were not covered. With the success of this year's demonstration and the goodwill that was generated, it will be possible to mount a bigger recruitment effort and provide coverage for more of the 64 parades that make Mardi Gras the greatest free show on earth. -- Cedric F. Walker, K5CFW [The author is Professor Emeritus, Department of Biomedical Engineering, Tulane University]. The American Birkebeiner Ski Race, known as the Birkie, is North America's largest cross-country ski race. Held in northwest Wisconsin, the race is 33 miles long, starts in Cable, and ends on Main Street in downtown Hayward. This was the 43rd year for the Birkie and 10,500 skiers came from the US and Canada, Finland, Sweden, Norway, Germany, Italy, Japan and many other countries. Eighteen years ago the Birkie Foundation asked the Amateur Radio community to help with communications along the race course and amateurs from a five-county area around Hayward in Sawyer County have been doing it ever since. There are nine medical and nine food stations along the race course that provide medical help to those who need it, with the food stations providing power drinks and refreshments to the skiers. Amateur Radio operators are at these stations to relay information regarding medical issues (dropouts, injuries, etc.) and food station needs (low on supplies for skiers, etc.) back to a net control station, which gives the information to the Birkie office during the event. The Lake Amateur Radio Association (LARA) of Lake County, Florida, and its ARES group were invited to take part in the county Public Safety Department Emergency Management Division's Severe Weather Awareness Day Exposition held at the Lake County Fair Grounds in Eustis, Florida on Saturday, February 20, 2016. County Emergency Management Division invited various disaster relief groups to display their emergency equipment that could be used in such events. Along with the LARA and Lake County ARES organizations, present were other groups such as the Lake County Sheriff's Office, Lake Emergency Medical Service, Lake County Fire Rescue, Southern Baptist-Disaster Relief, Salvation Army, and the Red Cross. These groups brought had their officials available to explain their organization's roles. Tours were also conducted. Our ARES unit researched various mass notification (alert) system vendors for a system that would work for us. After two no-cost trials, we have gone with One Call Now, and their basic pay-as-you-go package for $90 for 1000 "credits" - each notification call or SMS text counts as 1 credit, so our 70 member ARES group with a total of 122 contact numbers would be 122 credits per notification, giving us eight phone and SMS notifications. For my first test, I sent Winnipeg ARES Emergency Coordinators, AECs, PIO and two special tech savvy members (eight in total) an alert exercise message with request to meet me on the air on a local repeater. It didn't work well -- I only heard from one of the eight: The recipients were leery about answering calls from 1-877 numbers. I now have the system set up to display the "local" number for my ARES pager. For a wider audience test of Winnipeg ARES members who knew I was looking at a mass notification system vendor and that I was targeting a specific day for a test (a provincial holiday in Manitoba), I used the messager to distribute a draft exercise plan. As a result, for the actual test notification/on-air exercise net, I heard from half of the Winnipeg ARES membership (many were away for the long weekend). A group leader gets a report from the provider for each notification, and can log in and see a detailed report of which recipients answered and when they did so. I have made my AECs and PIO "messengers" so they each have a discrete log-in and can transmit a notification. Every two years the St. Lucie (Florida) Nuclear Power Plant is required to hold an exercise that is chiefly evaluated by the Federal Emergency Management Agency (FEMA) and the Nuclear Regulatory Commission (NRC). The purpose of these exercises is to test and evaluate the responses of plant personnel, law enforcement agencies, emergency management officials, and communications personnel. This year, the exercise took place on February 24. The scenario involved overloaded communication systems normally used by the public, rendering them unusable. ARES would provide radio communications among the county EOCs and other critical assets/support locations. ARES teams came and participated from St. Lucie, Palm Beach, Martin, Indian River, and Brevard counties. Operators successfully employed the UHF repeater-based Statewide Amateur Radio Network (SARnet) for most communications as well as an HF net on 7.245 MHz. The dual nets backed each other up for redundancy/reliability for the ARES mission of supporting each of the EOCs. SARnet is a network of linked UHF voice repeaters that serves the State of Florida. The state Department of Transportation (DOT) network that connects these amateur repeaters is a stand-alone carrier class microwave network. The use of this dedicated bandwidth provides a network much more likely to remain operational during a severe weather event like a hurricane. All ARES communications tests and requirements were successfully passed and met, with the use of the dual nets for backup capability being noted and praised by the evaluators. Martin County ARES also had a display of Go-Kits that illustrated what they do upon activation. It drew a good audience and plenty of questions from the responders. The FEMA representative visited ARES EC Steve Marshall, WW4RX, who discussed the kits and answered questions about SARnet and a map of its coverage and implications for its usage. A few years ago when Powerpoles started to emerge as the standard connector for ARES and RACES applications, it was time for me to change out my Molex connectors. Having no initial success in finding a die set for my Paladin CrimpALL tool, I noticed that DX Engineering was not only selling a crimp tool, but also individual die sets for PowerPoles, RG-8, RG8X and uninsulated and insulated wire connectors. After an exchange of e-mails with DX Engineering staff, I ordered the PowerPole die set. DX Engineering was not sure if it would fit my crimp tool but offered to accept its return if it did not. Eureka -- it fit perfectly as if Greenlee manufactured it! Subsequently, I purchased the RG-8 and RG-8X die sets for UHF and BNC connectors. The mission presented to ARRL Maryland-DC Section ARES: Find a radio beacon and save a life. It started on Friday, February 26, when an autistic adult was discovered missing. By Sunday, Section Manager Marty Pittinger, KB3MXM, and SEC Jim Montgomery, WB3KAS, received an e-mail from Joe Cotton, W3TTT, explaining the serious situation: "I was called last night by a member of the Northwest Citizen's Patrol, a partner with Project Lifesaver. An autistic man was discovered missing by his caretaker on Friday morning, two days ago." Cotton asked Pittinger and Montgomery if their organization had the means to locate a Project Lifesaver radio beacon leg bracelet, issued to incapacitated adults for rapid location, response and safe return. The local Project Lifesavers point-of-contact in Baltimore needed help. Pittinger, Montgomery and Cotton, with the CEO of Project Lifesaver, coordinated action using brief e-mail correspondence and telephone chats to define search criteria and share technical information. Contact was also made with local law enforcement agencies handling the missing-person case in order to set a protocol/format for Amateur Radio operators reporting to the police departments. ARRL Atlantic Division Director Tom Abernethy, W3TOM, was consulted and a plan was created and coordinated to handle this rather unique request. Section officials contacted local clubs to secure phase doppler radio direction finder equipment, and acquired the beacon frequency, radio range, and tone signatures. The goal was to activate the entire Maryland-DC Section's ARES statewide to perform a QTH-QTV ("stand guard," or listen on frequency) from every Amateur Radio operator's home station to detect the beacon and relay its location to local police. Amateur Radio mobile assets might be needed to determine the beacon's precise location. Once permission to activate was secured, Section Manager Pittinger issued an "Activation Announcement" to SEC Montgomery, who alerted and activated all ARES members to initiate the search plan/protocol. Pittinger then informed Project Lifesaver coordinators and police that the state-wide ARDF search was underway. The Maryland Port Authority identified the missing autistic man at Baltimore Washington International Airport, and MDC ARES was told to stand down.